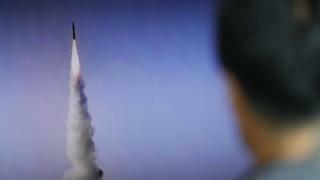 A North Korea diplomat has said the country's ballistic nuclear weapons programme is non-negotiable. Choe Son-hui said the US should "be prepared to co-exist with" a nuclear North Korea. She said it was "the only way to secure lasting peace on the Korean peninsula". CIA director Mike Pompeo earlier warned that North Korea would probably be able to hit the US with a nuclear missile within months. North Korea claims it already has the capability. Mr Pompeo stressed that Washington still preferred diplomacy and sanctions but said force remained an option for the US. How advanced is the nuclear programme? Speaking at a non-proliferation conference in Moscow, Ms Choe repeated phrasing used before by North Korean officials that nuclear weapons are "a matter of life and death" for the country. Earlier this year, she was reported as saying that the country's government would be open for talks with the US, if conditions were right. But on Friday Ms Choe said North Korea would consider the implementation of "so-called UN sanctions resolutions" an act of aggression and war. Since North Korea stepped up its missile testing earlier this year, sanctions against its economy have intensified. The Australian government said on Friday that it had received a letter from North Korea, seemingly also sent to other countries, urging it to distance itself from the US. On Thursday, Mr Pompeo warned that Pyongyang's missile expertise was now advancing so quickly that it was hard for US intelligence to be sure when it would succeed, but said it would happen soon. "When you're now talking about months our capacity to understand that at a detailed level is in some sense irrelevant," he said.